Jordan Abel is a Nisga’a writer from Vancouver. Abel’s work has appeared in numerous periodicals, and his chapbooks have been published by above/ground press and JackPine Press. Abel’s first book, The Place of Scraps (Talonbooks), was a finalist for the Gerald Lampert Memorial Award and the winner of the Dorothy Livesay Poetry Prize. Un/inhabited, Abel’s second book, was co-published by Project Space Press and Talonbooks. 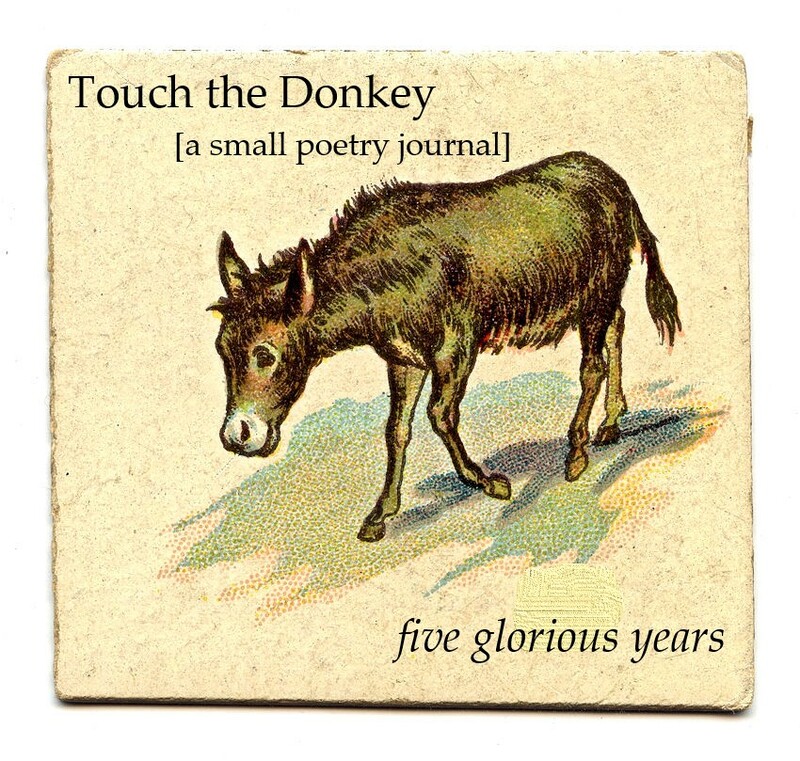 His poems “allegory,” “allusion,” “connotation” and “hyperbole” appear in the sixth issue of Touch the Donkey. These pieces are constructed entirely from public domain novels. On Project Gutenberg, there are 91 freely available Western novels that I copied and pasted into a single word document. That document ended up being over 10,000 pages. I then searched for words that related to the social and political aspects of land. “allegory,” “allusion,” “connotation,” and “hyperbole” diverge from the main conceptual project, but continue to explore issues of context, textual surface and reading processes. Given that the work fits so clearly into a specific project, I’m curious about what happens to such material after it has been removed from the finished work. Does it become the ‘bonus’ material of Un/inhabited, or might it fall into a further project? Or might this be the only home it sees? And how much material was removed? Was this it, or was there more? A: After I finished writing Un/inhabited, there was a lot of material that essentially fell to the cutting room floor. I had been writing excessively, and knew that there would have to be substantial cuts for the project to be thematically coherent. As a result, there were many threads that had to be removed entirely. Some of those threads (minority, oil, afeared, etc.) were closely related to main conceptual project, but, for one reason or another, didn’t fit perfectly. Those threads were probably the most difficult to cut. Other threads (maps, speakers, urgency, etc.) were interesting explorations and worked individually, but were easy to separate from the main project. However, as the project continued, there were several threads that emerged that had coherent and discrete themes that weren’t dependent on the pieces in Un/inhabited. One of those threads explored the deployment of literary terms, and, surprisingly, seemed to be supported by the source text. That thread included many pieces: allegory, allusion, connotation, denouement, dialogue, flash back, hyperbole, identity, metaphor, motif, narrative, personification, simile, symbol, and theme. To be honest, after I cut those pieces, I wasn't really sure what to do with them. The pieces in Un/inhabited (settler, territory, frontier, etc.) worked partially because they explored themes of indigeneity, land use and ownership. Those pieces were actively working towards the destabilization of the colonial architecture of the western genre. But what were these other pieces doing? What did an exploration of the context surrounding the deployment of the word “allusion” accomplish? Q: Is this how you have been building your manuscripts-to-date, through experimenting with an expansiveness before cutting away to hone the manuscript as a self-contained project? And what percentage of a manuscript might be cut away before you are left with a finished work? A: For the most part, yes. When I was writing The Place of Scraps, I made a conscious decision to just write as much as I could and then trim the manuscript back later. I had done this partly because I knew that I needed write in order to figure out what was good, what was bad, what was useable, and what had to go. I like your description. Experimenting with an expansiveness before cutting away. Here, I think the experimentation does accurately describe at least part of my process. There’s a certain amount of trial and error that was required for writing The Place of Scraps, and it was often necessary to write through the error before stumbling on something that clicked. Admittedly, with TPOS, about a quarter of all of the writing I did for that project didn’t work and was cut from the final publication. Things were a bit different for Un/inhabited. The process of exploration through error was much longer, more tedious, and was often paralyzed by the expansiveness of the source text. Each search query I made (and subsequently each piece that became part of the larger conceptual project) had an indeterminable outcome. And, worse, when I began the project, I had no idea what direction to go in or which ideas to pursue. The process tended towards exploring and querying in any and all directions. The result, with Un/inhabited, was that only about a quarter of all the material I produced ended up in the final published version. Which, of course, left a substantial amount of material unpublished and unused. Q: How did you arrive at such a collage-construction of writing expansively around and through a conceptual framework? Who or what have your structural models been over the course of your work to date? A: It’s tough to say exactly how I arrived at this model. I think, at least partly, expansive writing comes from the understanding that the conceptual project could, potentially, be limitless. Or that the full conceptual project could be far too lengthy to publish. But, I think, I came to this model of writing because there were very few other Indigenous writers exploring Indigeneity through conceptual writing. So far, I’ve found that conceptual frameworks can allow for different kinds of understandings, different kinds of readings, and different kinds of engagement with Indigeneity. I think, also, that the concept, as far as I’ve used it, has really allowed me to shift the focus of my writing away from myself and onto other texts. My personal engagement with Indigenous ideas and issues as a member of the Nisga’a Nation, as an intergenerational survivor of the Canadian residential school system, and urban Indigenous person has primarily been mediated through text and the materiality of books. The concept allows me to put those books front and centre. As far as structural models go, I’ve learned a great deal from many different writers and artists. And my work itself is entirely dependent on the work of others. But the conceptualists that I find very useful to learn from include Kenneth Goldsmith, Vanessa Place, M. NourbeSe Philip, and many more. It’s strange, though. It was only after I finished TPOS that I finally read Zong! by M. NourbeSe Philip. I’ve always thought that Zong! and TPOS have a lot in common. And it would have made sense for me to read Zong! before I wrote TPOS. But for some reason I missed it, and stumbled into erasure and found text almost by accident. Q: What do you feel that conceptualism allows you to explore and articulate that you might not have been able to otherwise? A: So far I think conceptualism has primarily allowed me to articulate a more complex relationship between Indigenous nationhood, textual surface, and foundational literatures. I'm sure, though, that there are many other things that conceptualism could potentially work towards. For me, I think, the most important aspect of using a conceptual framework in my writing was that it allowed me to imagine Indigeneity outside of the tropes of poetry. Q: Has your writing changed the way you see or understand yourself as Nisga’a? Have your researches expanded or clarified your knowledge, or are you working already from a foundation that is simply being articulated? A: That’s an interesting question. I would probably say yes. Often, when I’m writing, I’m thinking about how I construct my identity as a Nisga’a person, and, more broadly, how foundational and popular knowledges inform my identity as an Indigenous person. As I write through those foundational texts, as I readjust, question and subvert them, I am unsettling that knowledge and creating a space where identity can be constructed outside of the colonial apparatus. Q: I interviewed Armand Garnet Ruffo for Jacket2 a while back (http://jacket2.org/commentary/short-interview-armand-garnet-ruffo), and we discussed the line between writing a resistance and writing a presence. Where do you find your work along that same spectrum? A: I think Armand Ruffo brings up an important point. That if your writing is only resistant, only oppositional, only focused on decolonization, you kind of end up writing yourself into a corner. That resistance alone is somehow insubstantial and unsustainable. More or less, this makes a lot of sense to me, and I think it’s exceptionally important to balance out that resistance with presence. Or perhaps balance out decolonization with resurgence. In terms of where my writing falls on that spectrum, I hope that both resistance and presence are there. Primarily, the texts that I’ve focused on as source texts have all been written from a settler-colonial perspective, and, I think, have pointed towards the kinds of foundational knowledges that should be resisted. My challenge, so far, has been to articulate an Indigenous presence from within those texts. TPOS is probably my most accessible example of this. From within Barbeau’s voice comes my own voice, an Indigenous voice. In that resistance and disassembly of Barbeau’s writing an Indigenous presence emerges.